What is this successful formula that encourages turnover in sales and sustains the return of repeat customers? Is it the location, the quick service or the generous amounts of food for a 30 dollar package? I have always wanted to get those gelato containers sold from a fridge near the entrance. Personally, I like the pastas, with a light sauce, variety of flavours and servings more than any one can handle. Parking is limited off the street and the restaurant lies between the Tom Ugly Bridge and Kirawee. Friday evening, the first one of December and I found myself on the main strip of Gymea. The last time I was there I was on an auditing visit. How long ago that seemed, and yet the experience is recollected with clarity. I had found it a long way to drive down to Gymea from Sydney's northern suburbs at dawn, and to me then it was like being on the frontiers of the moon. The Gymea Pub in 2009 has managed to find the right balance of informality, sufficient diversion and a generous amount of space for its patrons to scateer in groups or allow couples to settle in niche corners. The main customer demographic wore thin light summery t shirts with tight fitting pants, mid-calf or long, and the most popular drink that night was the Bundaberg rum, mixed or straight. Lor mee is another of those street foods that are not commonly available in Western societies, but are easily found in southern China, Thailand, Malaysia and Singapore. The dish is iconic of the Teochew Province in China and has been mainly brought to equatorial climes by immigrants over the last few centuries. It combines snippets of ingredients in a thick savoury sauce. Above, the lor mee with roast pork and sliced hard boiled egg accompaniments at the Fong Sheng Cafe, along Lorong Selamat in Georgetown, Penang - the place was introduced by May Wah and Henry Quah. The cafe harks back to the seventies or eighties - and maybe earlier - what caught my eye were (above) freshly blended fruit and/or vegetable juices and (below) metal and plastic contraptions of the food trade. Hot and cold drinks are easily on offer from the cafe (above and below) at very reasonable prices. The previous long standing branch of jewellers B.P De Silva, almost at the corner of Bishop and Beach streets in the old quarter of Georgetown, has a few months ago been transformed into a hub of Straits Chinese cuisine. 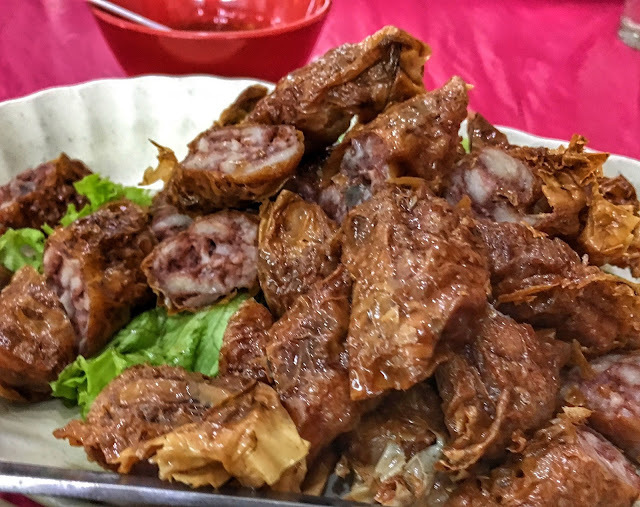 Straddling two shop lots, located in an evening quiet location but near to the banking district on business days, Aunty Gaik Lian's provides a refreshing change to the Nyonya food landscape on Penang island. I have always found that the best Straits Chinese food is found in homes in Penang, like what my Mum dishes out, and it has been exasperating to be really satisfied with commercial outlets in this cuisine. The Penang variation of such Peranakan food tends to be more influenced by ingredients and cooking styles from Thailand and the Malayan peninsular , when compared to the Malacca version (with more of stronger Indonesian influences and the use of the buah keruak fruit).